Sometime in early January, we began to feel overwhelmed by the winter doldrums. Later in the month we grasped for an explanation of why we were feeling this way. We observed that since Thanksgiving, we had not ventured more than 1.5 miles from our house. A change of scenery would be good. Just a weekend someplace else. It doesn’t have to be far, but it should be someplace we enjoy going. So we scheduled a trip to Madison for mid-February. As much as we like Madison, it’s a difficult destination for us to access, since we don’t own a car. The train is our preferred mode of travel, and one of our city’s most compelling perks is its Amtrak station. Madison does not have an Amtrak station (yet), and bus service between here and there has been erratic. We learned that Badger Bus now runs each way between Minneapolis and Madison, passing thru town at a reasonable time and getting us there in a little over three hours. The catch is that it only runs Friday thru Monday, so you can’t get there in the middle of the week. But for us, to go there on Friday and come back Monday was perfect. That gave us two days and three nights to be in town. We stayed with a friend of ours – a La Crosse person who’s temporarily transplanted to Madison – and her cat. We were provided with a little base that was a mere block from a bus route that conveniently brought us to the best parts of Madtown within a half hour. On Saturday, we visited the winter farmers market, which is probably busier than most summer farmers markets in Wisconsin. We got there too late to get in on what sounds like an awesome breakfast, but we’re also told that it gets insanely crowded at breakfast time. 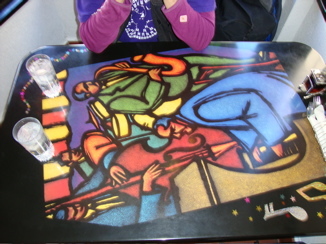 So we had Hmong food on State Street, at a place that used to be a jazz club, so the restaurant had all kinds of musical notes and pictures of instruments painted on the tables. We prowled around the shops looking for some things we need that we can’t find at home, got wired on some good fair-trade coffee, and got annoyed by our inability to find a basic purple sharpie. We marched into the west door of the capital, thru the center of the rotunda, and out the east door. We continued back down the hill taking in what was a fairly nice day for February, and simply enjoying being someplace different. We kept walking until we got tired, and then got on the bus. We spent Saturday night eating pizza and watching videos with our host and her cat. On Sunday we spent a couple of hours visiting and catching up with a Madison friend who we haven’t seen for several years. Then we spent the evening visiting with a family member who’s lived in Madison for a few years now, and who always seems to bring us into some sort of wonderful foodie experience every time we visit. This time she brought us all to visit a friend of hers from India, who makes (what else?) fantastic Indian food (something else we can’t get at home). He prepared a great dinner while we were there, and RoZ watched intently from the counter, barraging him with questions. Obbie observed that he hadn’t seen her so excited for a long time, and realized that this was the kind of experience we came for. We ate, talked, ate, drank wine, exchanged family gossip, ate, looked at the view from the 15th floor window, drank some more wine, talked some more, and ate some more. The next morning, we weren’t hung over (it was good wine, and we didn’t have that much). We took the bus to Memorial Union and got on the bus that took us back home. Spending too much time in one place can be stagnating. It’s useful – and often necessary – to occasionally evaluate your environment from the outside looking in. Looking at a much bigger picture, Carl Sagan often said, “to understand your own world, you have to look at other worlds.” The same can be said for communities. We look at our own community in a different way when we’ve had fresh experiences with other communities. So the cabin fever is eradicated…. for now. This entry was posted in Community, Stories, Transportation. Bookmark the permalink.